Your Koh Samui Holiday Starts Here! Welcome to the world of Villa Samprasada, located on the northern foothills of the exotic and magical island of Koh Samui in the Gulf of Thailand. This wonderful villa, overlooking tall swaying coconut palms to a distant view of the ocean, is the place where ‘the stars’ slip-off-to when they want a well earned break. Villa Samprasada (Sanskrit word meaning ‘serenity’) is the place to relax, unwind and recuperate in luxury. The villa’s owner is a Los Angeles television producer and the villa reflects a lifestyle where dreams can become reality. By Day… The villa presents some wonderful indoor/outdoor lifestyle options; swimming, sunbathing on the comfortable sun-loungers around the pool, sipping on a cool tall drink as you ponder your next move. Or maybe the pure bliss of a traditional Thai massage! By Night…The villa becomes a wonderland for the senses as the soft mood lighting transforms the villa into a romantic tropical paradise. Imagine the gentle murmur of quiet conversation, the flicker of soft candlelight and the sound of music floating in the air with three zones of outdoor speakers. This villa can become what you want it to be; a private oasis away from the rest of the world or a magnificent entertaining environment. Villa Samprasada is the perfect hideaway haven for one or two couples. Each couple has their own private accommodation wing with total privacy and space. And each couple's bedroom looks out onto the pool. As you would expect from a villa of this caliber, almost every detail of the interior and exterior finish is flawless. 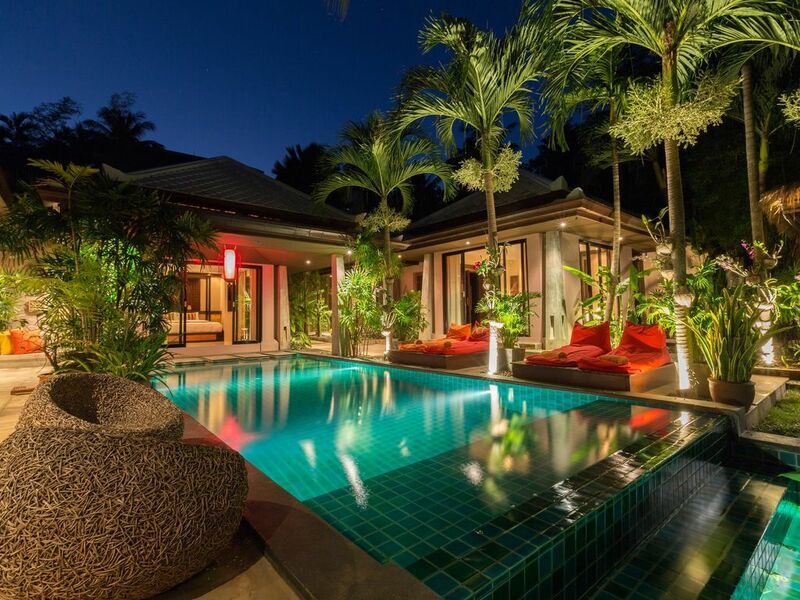 The villa recently graced the front cover of Koh Samui’s prestigious Real Estate Magazine for its contemporary design. Just this year it graced the cover of Avenida magazine, a Dutch Architectural magazine. Two bedrooms with King size beds. Each bedroom is in a private wing of the house. Master Bedroom has satellite TV, DVD and CD player and Satellite. Large stylish ensuite bathrooms featuring an indoor/outdoor theme with oversized Balinese Bathtubs suitable for one to six people! Expansive outdoor seating and conversation/entertainment pavilions. Dining room table seats up to ten. Wireless high-speed Internet access - send and receive your e-mails inside the villa or beside the pool. We use Pool RX in our swimming pool, which keeps the pool sparkling clean and requires little chlorine and is more environmentally friendly. If you play golf, grab your clubs. There are two magnificent courses on the island. The newest course, Bophut Hills is literally one minute’s drive away from the villa. I've traveled to 75+ countries and could have chosen a vacation home almost anywhere, but I found that Thailand was the one country I really missed when I was away...and it always felt great to be back. I started traveling to Koh Samui in 1995 when Chaweng was just a dirt road. In later years I would bounce back and forth on my Thailand trips between Koh Samui and Phuket, but found I much preferred Koh Samui... My wife and I found this house accidentally. There was a misprint on a real estate sign and we thought the house was 1/4 of the price it was actually listed it. However, we didn't know this until we had seen the house and....had fallen in love with it the minute we walked in the door and had to buy it. I say in the listing that the villa looks just as the pictures represent it to be....a Balinese fantasy home (in Thailand). When the house is lit up at night it is spectacular....really beautiful. And waking up in the morning one of the bedrooms has a straight shot to the sunrise, (depending on the time of the year) which is fantastic. Living here, we entertain a lot and it's a great house for that. And the house is very private, as is most of the pool, and that is a big bonus. The villa is good sized, and I know of many homes that are even larger that don't have the lifestyle aspects that this villa offers. The villa builders also did a great job with the landscaping so that the entire grounds is lush...looking from every room you have a great abundance of lush landscaping (even more lush since the photos were taken). I also appreciate that you can get to Fisherman's Village/Bophut in about five minutes drive and the restaurants there are great (and varied), and the village is fun to walk through and shop and we love Friday night walking street in the village. And if we want to go to Chaweng for even more extensive nightlife, it's only 15 minutes away. 2. Each with shower and outdoor bath tub (one tub holds four people and the other holds up to six). We are just a five minute drive from Bophut Beach, 7 minutes from Maenam Beach. Very Very Very Very Distant Ocean View (House in terraced over jungle that spreads out below) for a few miles. Separate Air Conditioner In Each Wing (one in each bedroom wing, one in the main living room and kitchen wing) plus fans in living room, bedrooms, outdoor sala, and outdoor dining pavillion. Suzy Nina Fine Bedding. High thread count. One space in front of villa and additional parking directly across street for multiple cars. We bring in fluffy beach towels from the US. No--but there is a gym two minutes down the road. And so many homes in Thailand don't have this! A very well stocked assortment. We love to cook---and even fly in kitchen items from William Sonoma. The Thai System only allows two Satellite Connections. The living room has a 52' TV and 42' Plasma and DVD with Satellite in one guest wing and second bedroom has 42' Plasma and DVD (no satellite). Satellite available in Living Room and One of the Two Masters with full complement of UBC Channels. HBO, etc. We keep CD's in the living room. You can buy any current release movie for 100 Baht in Fisherman's Village or almost anywhere on the island. We have a HUGE selection of movies and TV shows. The villa is all one story but the pathway in isn't easily one to push a wheelchair down. However, once in the villa in the main wing you can use a wheelchair between the master bedroom and the living room/kitchen (all one level and tiled). However, to go into the bathroom there is a one inch drop. When we broke our ankle and stayed in the villa, we stayed in the bedroom wing that was accessible to the kitchen and used crutches or walker when going into the bathroom. Each Bedroom has a Fantasy Balinese Bath---See Photos (no jets). Each Bedroom Wing Has Two Balinese Fantasy Bathtubs--one holds two people, and the other holds up to six. The villa is gorgeous, lots of different areas to just hang out. Days spent floating in the pool with a nice cold beer. Great location only a sort drive from the airport, and tucked away so you feel secluded, but close enough to Fishermans village for breakfast with a view. Loved being able to see the elephants at the nearby sanctuary as we drove by everyday. Love love loved it. Really comfortable bed too, and I miss my outdoor shower. Peaceful zen space perfect for rejuvenation or romace! This villa is DELUXE - it has everything you could possibly want...it is peaceful and private, but easy to access the hustle-bustle on the island, when you want it. It is spectacularly appointed - with stunning local furnishings, and a lovely pool at the center of the property. There is ample room for guests to have all the privacy they could want, with lots of lovely social space, as well. I couldn't have imagined such a lovely place. I am already planning my return next year!! of comfort made me feel weirdly at home then the combination of that, the luxuriousness of the setting and design and the romance of spending our days and nights nights dipping in and out of the pool, the joy of doing that in the warm rain (when it did rain), never having to leave.... it was so special. Then when we did leave for some delicious meals out nearby, coming back to this house is DIVINE!!!! This review has been a long time coming we stayed in 2015 and had the most incredible time. My parents and my sister and myself still think this is one of the most beautiful places we have ever stayed in. Both my sister and i (late 20's) were able to go out at night and come home safely, whilst my parents could enjoy their nights in the villa or exploring the island also. There was plenty of room for our family, heavenly aircon and the pool that none of us could get out of. It was such a pleasure getting to meet Rob, he was incredibly gracious and assisted us with anything and everything we could possibly need. Thank you Rob, we can't wait to return hopefully soon! Stayed in Villa Samprasada with another couple. The place is on the hillside behind Fisherman Village. Great location for relaxing but also exploring the island. The check in was smooth and flawless and Koun Oh was very friendly. Rob, the owner, was very good at providing advice on the island and he knows the best places to go. My favourite is Fisherman Village. Try Cafe 69 and Hansar Hotel restaurant there. The villa has a great arrangement and it feels spacious for two couples and gave us all enough privacy and days of fun! Would love to come back! Villa Samprasada is located just a four to five minute drive from famous beachfront Fisherman's Village, with it's abundance of restaurants, bars and shops. Fisherman's Village is right on Bophut Beach, where you can swim, walk, or jetski. And you're just 15 minutes from Chaweng Beach. The villa affords you privacy but within four minutes you can drive down to the Ring Road, which circles the island. Check in time is 3PM and checkout time is 10:30AM.